Here we present a protocol to obtain several blood samples from the antecubital vein during high-intensity interval training. This protocol may be useful for the measurement of blood metabolites and endocrinal markers during exercise. Nalbandian, M., Radak, Z., Takeda, M. Evaluation of Blood Lactate and Plasma Insulin During High-intensity Exercise by Antecubital Vein Catheterization. J. Vis. Exp. (135), e56890, doi:10.3791/56890 (2018). The measurement of metabolic and endocrinal markers during physical activity is of relevance to understanding the physiological implications of different exercise modalities. During some exercise modalities (e.g., high-intensity interval exercise), blood metabolites and hormonal levels change in short periods of time. In the present study, we describe a method to catheterize the antecubital vein, which allows the collection of several blood samples during exercise. Insulin and venous lactate concentrations were measured during high-intensity exercise by the application of the described method. The exercise consisted of three 30 s bouts of high-intensity exercise separated by 4 min of recovery. After the last recovery period, a Wingate test was performed. Blood samples from the antecubital vein were obtained before and after each 30 s bout and before and after the Wingate test. As a result, it was possible to evaluate the plasma insulin and venous blood lactate variations during the exercise. The measurement of metabolic and endocrinal markers during physical activity is of relevance to understanding the physiological implications of different exercise modalities. During some exercise modalities (e.g., high-intensity interval exercise (HIIE)), blood metabolites and hormonal levels fluctuate in relatively short time1,2,3. Many sports (i.e., soccer, basketball, and rugby) consist of short periods of high-intensity exercise separated by low intense exercise and/or passive periods4,5. HIIE presents similarities with the aforementioned sports and is therefore widely used as a training method for athletes6. Moreover, because of its similarity with sports, HIIE has been used as a model to study exercise physiology7. Blood sampling is critical to measure physiological variables, and it is frequently used for research purposes and the evaluation of the physical condition. However, blood sampling during HIIE can be technically difficult because of the short time between sample collections. As a solution to this problem, here we present a method to obtain blood samples by antecubital venous catheterization in short periods of time while subjects perform HIIE. All methods described here have been approved by the local ethical committee (Doshisha University Ethical Committee: 15033), and were in strict accordance with the standards set by the Declaration of Helsinki. Informed consent was obtained from all participants. Participants were male recreational athletes (age, 20.1 ± 1.2 years; weight, 69.7 ± 6.2 kg; height, 176.1 ± 5.8 cm; body fat 13.6 ± 1.5% and VO2max, 52.6 ± 6.6 mL/min1/kg1). NOTE: The present study consisted of the evaluation of blood hormonal and metabolites dynamics by blood sampling from the antecubital vein during a HIIE protocol. Ask the subject to perform a warm up with 5 min of cycling in the ergometer at low intensity. After the warm-up, let the subject rest for 5 min. Ask the subject to perform the following HIIE in the leg cycle ergometer: three bouts of 30 s high-intensity exercise, separated by 4 min of rest (Figure 1). NOTE: The 30 s bouts should be set at an intensity equal to 90% the power average of a previously performed Wingate test. Refer elsewhere8 for a complete description of the Wingate test. NOTE: In this model, the mass is the work load (kg), and the acceleration is 9.81 m/s2. The distance is the wheel diameter (1.622 m). Because the wheel rotates 3.7 timed /peal rotation, the distance per pedal rotation is 3.7 x 1.662. Furthermore, because the pedal frequency is 90 rev/min1, we have to multiply one pedal distance by 90. NOTE: Tubes and vacutainers should be labeled beforehand to avoid losing time. Wrap a tourniquet to the arm selected for the catheterization. To do this, place an elastic band at the back of the chosen arm. Stretching the band, make a loop with the band around the arm and tie the elastic. Select the visible antecubital vein and sterilize the skin with ethanol or alcohol. Insert the tip of the sterilized cannula into the vein at an approximate angle of 15° with the skin. NOTE: The cannula should be inserted from the proximal to distal direction. If cannulation is successful, a backflush of blood should be observed. Secure the cannula with the hand, and remove the needle softly. NOTE: To maintain the angle of the needle during the exercise, cotton tissues may be used in between the skin and the needle. Fix this structure with a tape. Connect a vacutainer with heparin and aspirate for the first blood sample (approximately 2.5 mL). Immediately after, refrigerate the blood sample by putting it in an ice box for no more than 40 minutes. Ask an assistant for help, if blood gases are going to be analyzed. Connect a tube to the catheter and inject heparin to the full length of the tube so as to avoid blood coagulation. Close the butterfly. Using tape, stabilize the catheter. Ensure that at this point, the arm mobility of the subject does not interfere with the blood collection. To confirm this condition, be sure that the needle position is not affected by any movement. Remove the heparin by using a vacutainer until there is only blood in the catheter. When blood flashback is observed, collect the sample as described in step 2.5. After the sample collection, inject heparin again into the catheter tube to avoid blood coagulation. After this action, step 2.5 may be repeated for several samples collection. After the last sample is collected, carefully remove the cannulation tube and clean the skin with alcohol. To avoid possible bleeding, ask the subject to keep sterilized cotton at the place where the catheterization was made. After blood is collected in the vacutainer tubes, carefully pass approximately 1.5 mL of blood to a 1.5 mL tube and keep the tubes on ice. Measure blood lactate from the remaining blood using a lactate detector. On the same day, obtain the plasma the blood samples (around 1.5 mL of blood). For plasma separation, centrifuge the blood samples for 5 min at 5000 x g at 4 oC, and separate the supernatant in a new 1.5 mL tube. Repeat the centrifugation one more time to purify the plasma. After the plasma separation, store the samples at -80 oC until the hormone analysis. Measure the plasma insulin using an ELISA kit as per the manufacturer's protocol (see Table of Materials). 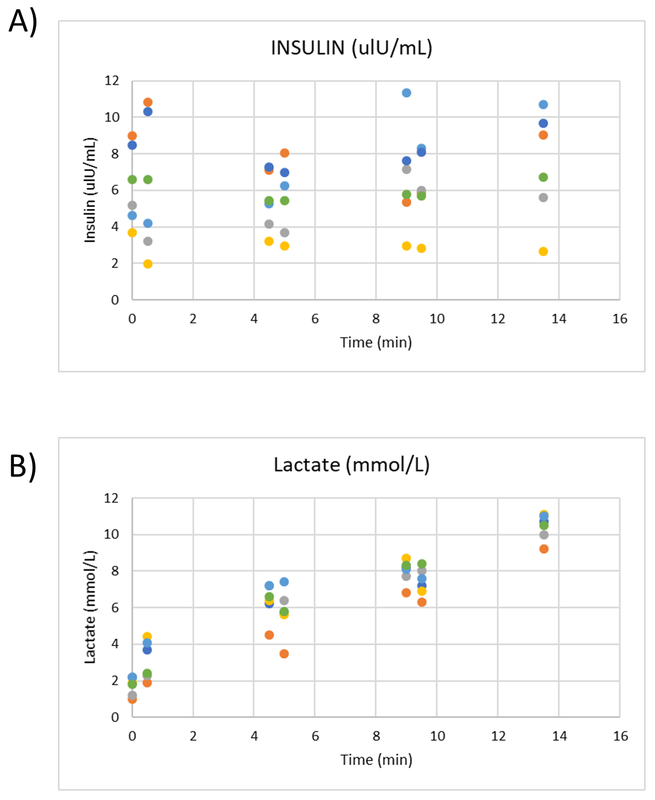 As representative results, we used this protocol to measure blood lactate and insulin variation in six subjects during a HIIE in a cycle ergometer. Peak power and Average Power for the Wingate test were 732 ± 120 and 549 ± 84 Watts, respectively. Average Power was used to calculate the power output (494 ± 75 Watts) during the 30 s bouts of the HIIE. Figure 2 shows plasma insulin and blood lactate variation during the HIIE. Plasma insulin (Figure 2A) decreased during the first and third 30 s bouts but increased during the second bout and the recovery periods. On the other hand, plasma lactate (Figure 2B) decreased during the second and third 30 s bouts, but increased during the first 30 s bout and the recovery periods. Figure 1: Exercise protocol. Red arrows indicate the time of blood samples collection. Please click here to view a larger version of this figure. Figure 2: Experimental results. (A) Plasma insulin (ulU/mL). (B) Blood lactate (mmol/L). Each color represents a different subject. Please click here to view a larger version of this figure. In this study, the antecubital vein was catheterized, and blood samples were successfully collected during a high interval exercise. As an example of the use of this methodology, blood samples were analyzed for blood lactate and (after plasma separation) for plasma insulin. The main advantage of this method is that it allows the collection of blood samples in short periods of time. At the same time, it does have some limitations. For instance, the limited exercise modalities that allow its use; the number of assistant needed, and specialized trained personnel required; and the risk of low sample volume as a consequence of low blood pressure in the forearms. For a successful blood sample collection, the subject's arm should be in static position. Because the forearm mobility is reduced, in its current form the method can be applied only to a few exercises modalities. Here, we described how to apply the method when the exercise is performed in a cycle ergometer, but with modification, it could be used on a treadmill running machine. In both cases, personnel with experience in blood collection is needed. Regarding the exercise protocol, there are some considerations that should be addressed. If several trials are going to be evaluated (e.g., with and without active recovery between bouts), the moment of decision for the testing is critical. In order to avoid diurnal hormonal variations10,11, it is recommended to perform all trials at the same hour on different days. Furthermore, metabolism is affected by the time of day and meals consumed. Therefore, fasting is recommended before the tests. Additionally, to improve reproducibility, a familiarization period with the exercise protocol by the subjects before testing is recommended. In this period, experimental subjects should perform (progressively) similar exercise to the main test. In conclusion, we described an effective method to obtain several venous blood samples during exercise. This method can be useful for collecting samples that can be used to study several molecules during exercise (e.g., metabolites, hormones, protein and RNA). The authors would like to acknowledge Dr. P. Karagiannis for reading the paper and Professor T. Hoyo for his technical support. Wahl, P., Mathes, S., Köhler, K., Achtzehn, S., Bloch, W., Mester, J. Effects of active vs. passive recovery during Wingate-based training on the acute hormonal, metabolic and psychological response. Growth Horm IGF Res. 23, (6), 201-208 (2013). Wahl, P., Mathes, S., Achtzehn, S., Bloch, W., Mester, J. Active vs. passive recovery during high-intensity training influences hormonal response. Int J Sports Med. 35, (7), 583-589 (2014). Nalbandian, H. M., Radak, Z., Takeda, M. Effects of active recovery during interval training on plasma catecholamines and insulin. J Sports Med Phys Fitness. (2017). Stolen, T., Chamari, K., Castagna, C., Wislff, U. Physiology of Soccer. Sport Med. 35, (6), 501-536 (2005). Bangsbo, J. The physiology of soccer--with special reference to intense intermittent exercise. Acta Physiol Scand Suppl. 619, 1-155 (1994). MacInnis, M. J., Gibala, M. J. Physiological adaptations to interval training and the role of exercise intensity. J Physiol. 595, (9), 2915-2930 (2017). Emberts, T., Porcari, J., Dobers-Tein, S., Steffen, J., Foster, C. Exercise intensity and energy expenditure of a tabata workout. J Sports Sci Med. 12, (3), 612-613 (2013). Smith, J. C., Hill, D. W. Contribution of energy systems during a Wingate power test. Br J Sports Med. 25, (4), 196-199 (1991). Dotan, R., Bar-Or, O. Load optimization for the Wingate Anaerobic Test. Eur J Appl Physiol Occup Physiol. 51, (3), 409-417 (1983). Carrasco-Benso, M. P., et al. Human adipose tissue expresses intrinsic circadian rhythm in insulin sensitivity. FASEB J. 30, (9), 3117-3123 (2016). Hatfield, D. L., Nicoll, J. X., Kraemer, W. J. Effects of Circadian Rhythm on Power, Force, and Hormonal Response in Young Men. J Strength Cond Res. 30, (3), 725-732 (2016).